Not all of the early forays into psychology were based on solid science. Phrenology was started by Franz Joseph Gall (1758–1828) in the beginning of the nineteenth century. Gall believed that specific psychological traits could be localized to specific parts of the brain. When any of these individual traits were prominent, that part of the brain would grow larger relative to the rest of the brain and would push outward against the skull. These enlarged brain areas would then cause bumps in the skull. Consequently, careful examination of the shape of the skull could reveal the person’s psychological profile. Gall based his conclusions on empirical techniques (i.e., he measured the skulls of hundreds of people), but his biased methods allowed him to pick and choose his findings to fit his theories. 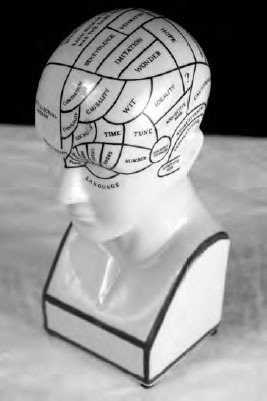 Phrenology became very popular over the next century, and phrenology busts were quite common. Phrenology only fell out of favor in the twentieth century after modern science advanced enough to prove it wrong. As with eugenics, it was sometimes used to justify racist and socially prejudiced theories. Similarly, it was adopted by the Nazis to prove Aryan supremacy. On a more positive note, it challenged neuroscientists to study the important question of localization of function to ask which parts of the brain support different psychological functions.